What do the fruit of a shrub that grows in frozen desert (tundra) and a hard, ugly black fungus that thrives on birch trees have in common? Aside from growing in northern latitudes, altitude, and their cold climates, both sea buckthorn and chaga are natural, homeopathic remedies well known throughout Russia and eastern Europe, and, increasingly, in Canada but are little known in the U.S. Read just a bit about the purported health benefits and symptoms these two plants are used to treat, and you will be as intrigued as I was when I discovered them. During my trip to the Baltics, my group and I frequently noticed sea buckthorn was an ingredient in dishes, particularly desserts. We finally Googled in our curiosity and were instantly hooked. The Interwebs are full of sites touting the amazing medicinal uses of sea buckthorn. Sea buckthorn even has its own WebMD page. Sea buckthorn grows in high-altitude, arid and cold climates, such as Russia, central Asia, and eastern Europe, historically, but in the past century, it was successfully transplanted to Saskatchewan, Canada. The woody plants have been planted to help control soil erosion, but it is the uses of bright yellow-orange fruit and seeds of the sea buckthorn fruit that excited me. I found that it resembled somewhat persimmons or kumquats, but its skin is comparable to that of a tomato. It is exceedingly tart – not the sort of fruit easily eaten without the addition of sugar or other complementary flavors. Sea buckthorn has a high concentration of flavonoids, vitamins (such as C and E), minerals and other nutrients. It is believed to have anti-inflammatory properties. Its fruit pulp, oils, and seed oils have been used to treat a wide range of gastrointestinal issues, ulcers, and acid reflux, as well as high blood pressure and cholesterol, countering the side effects of chemotherapy, and various skin rashes and disorders (ingested or applied topically as an ointment). While in Estonia, one of my fellow travelers had a chronic case of acid reflux for six months; he had tried a number of medications and doctors’ visits in the U.S., but nothing seemed to work. He began taking a supplement of sea buckthorn daily, and within a week, he had a noticeable reduction in his symptoms. Was it the placebo effect, or the sea buckthorn? Long-term studies of the impact of sea buckthorn are scant, but short-term studies showed positive results. Read a few summaries to get you started here. During a trip to central Maine, I recently had my first encounter with chaga, a tough, dense, charcoal-colored fungus found on birch trees, throughout Russia, eastern Europe, Canada, and New England. After an unexpected coughing fit (hey, it was 0 degrees Fahrenheit/-18 Celsius – apparently entirely too cold for my already cold blood! 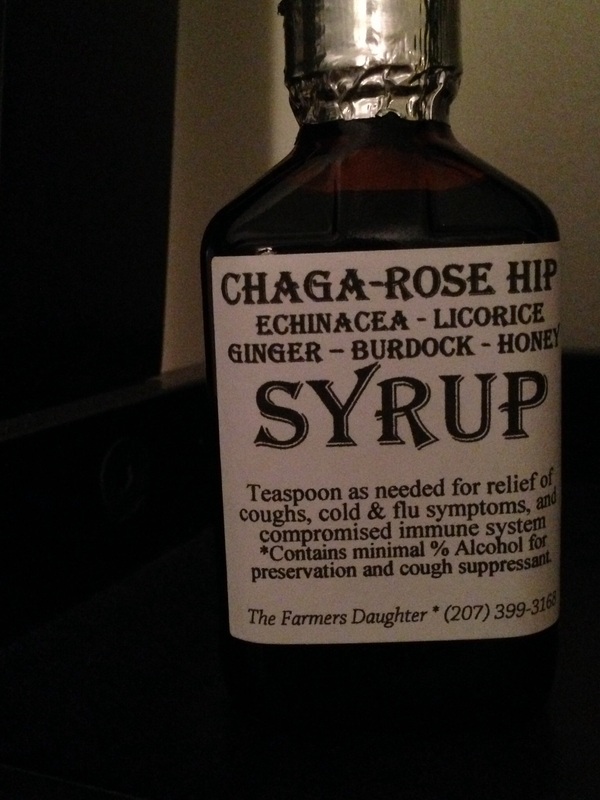 ), a good friend suggested I try a locally made chaga cough syrup that also is used to boost immunity during the harsh winter months. Within 30 minutes, I had stopped coughing. I was so impressed I had to order it from The Farmer’s Daughter, the local business responsible for this great concoction – even better because it is homemade from whole ingredients, rather than manufactured commercially. When I returned home, I did a little chaga research. Like sea buckthorn, chaga is considered to possess anti-inflammatory properties has been a homeopathic remedy for a number of ailments, such as psoriasis; it allegedly inhibits cancer cell growth, and it can be used to treat allergies. This article is an easy read that summarizes the immune-boosting properties of chaga. Watch out; you may be hooked. If you live in Europe (yes, you probably wouldn’t need to read this post), then you can find sea buckthorn oil as a supplement at a standard pharmacy or Bio (natural/organic products store) or even as a featured ingredient on a restaurant menu. If you’re in the USA, check out your local natural foods store, vitamin shop, or online supplier. Chaga is a bit of an easier find than sea buckthorn, as several teas and supplement pills contain chaga or extractives of chaga, or Betulin, a key active ingredient in chaga. 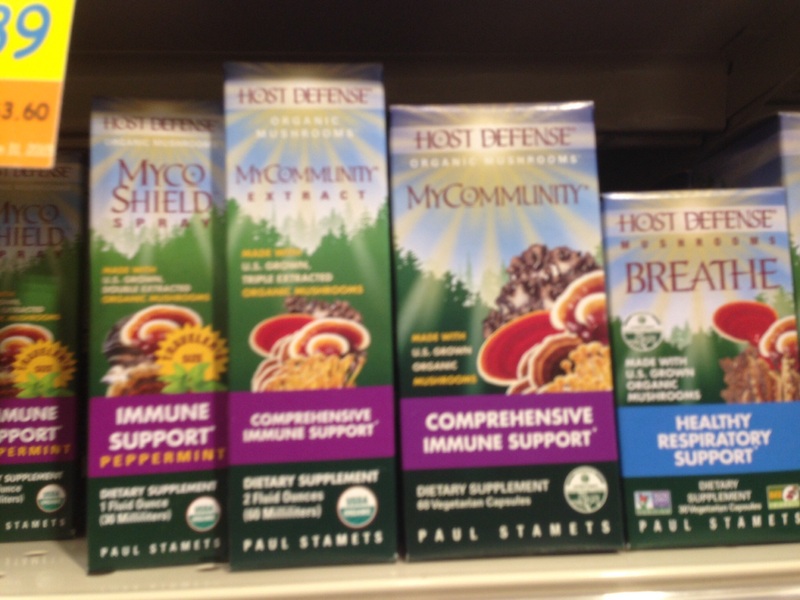 Various forms of chaga as an immune-boosting supplement in a standard American natural foods grocery. *Disclaimer: please consult with your qualified health professional before introducing these or any other supplement into your health regimen. Learn about potential side effects, including sea buckthorn’s anti-clotting properties (not unlike aspirin).